William Gibson who coined "cyperspace" has been very prescient, predicting where the internet will go. A few years back, he wrote a book called Spook Country (2007). A central theme was "locative art." Using a visor, you could see art exhibited on location. But it wasn't just any kind of art. You could see the past being exhibited in the present. The essence of locative art is sharing ghosts. This was the inspiration behind enabling GPS while building the world's largest locative art atlas showing where art and innovation took place. 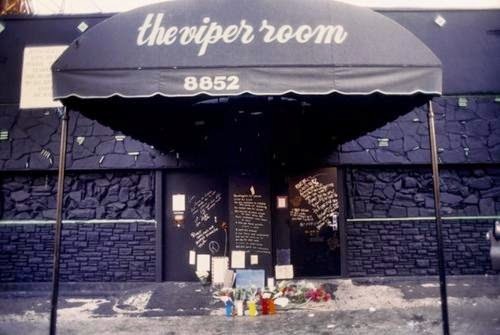 In Gibson's Spook Country, at Viper Room (8852 Sunset, LA), at a locative art exhibit, you could see where River Phoenix died outside, his body still there. His sister Rain Phoenix had tried mouth-to-mouth resuscitation. Oct 31, 1993, Red Hot Chili Peppers Flea (Michael Blazary) was in an ambulance with River Phoenix from the Viper Room, where he collapsed outside, to Cedar Sinai Medical Hospital, where he was pronounced dead at 23. 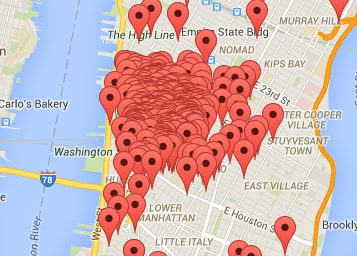 Locative art can be expanded by 360 degree narratives with fast-forwarding (or rewinding). The pay phone where Joaquin Phoenix called 911 is still there today. You can add background tracks to augment a location. 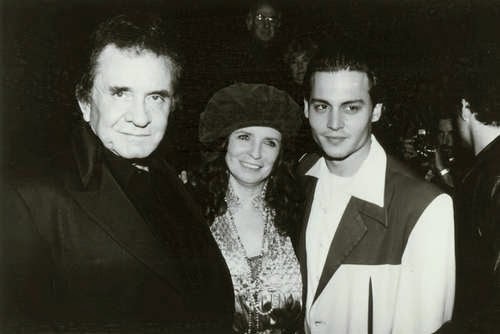 Viper Room owner Johnny Depp seen here with Johnny Cash and June Carter was inside when River Phoenix died on Halloween 1993 outside. Future Clueless (1995) star Alicia Silverstone was bartending that night. You can add before-it happened background or after-it-happened evolution. Gangster Bugsy Siegel hung out here 1940s. Tom Waits helped re-develop the club. Locative art is about creating an artview (movieview, musicview, photoview, storyview etc) with many angles (and time stamps) instead of a stock streetview fixed in time. In a wider view or different angle, locative artifacts may be used in the future by geo-sleuths to help identify and stitch other images nearby. 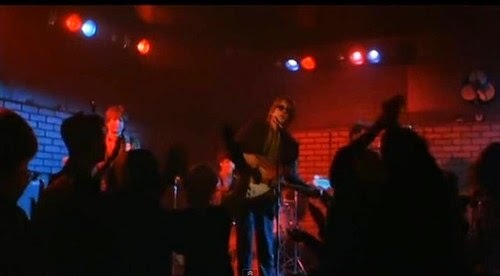 This is a long shot of John Travolta in Be Cool (2005). 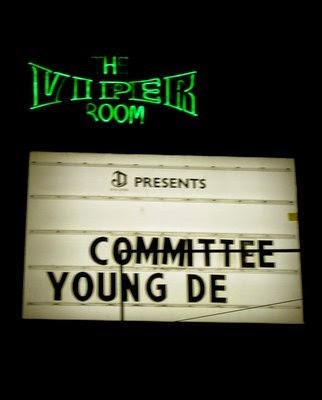 In Be Cool (2005), Vince Vaughan sits with The Rock at Viper Room VIP booth. Re-creating a vibe is part of locative art. 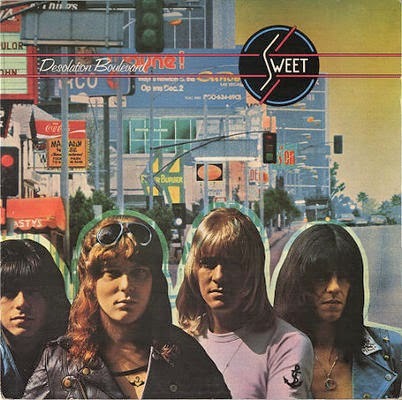 This is the album cover for The Sweet's Desolation Boulevard (1974), which featured Ballroom Blitz, outside Viper Room. 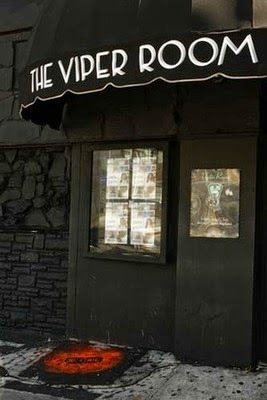 Bruce Springsteen once played an impromptu show here. In locative art, you can also stitch related "ancillary" locations. The night River Phoenix died Oct 31, 1993, he was staying at Hotel Nikko (465 S La Cienega Blvd), now SLS Hotel (seen below), with girlfriend Samantha Mathis. Locative art can connect to a biography thread by recent locations. You can follow the actual course of history. You can also jump to other stories at the same location. 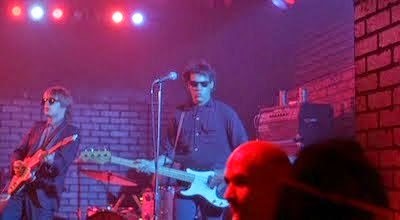 Tommy Lee Jones of Motley Crue was convicted of battery after he pushed Henry Tappler at Viper Room who tried to take a photo of his wife Pamela Anderson Sep 26, 1996. You may wish to follow a story of your friend or your hero here. 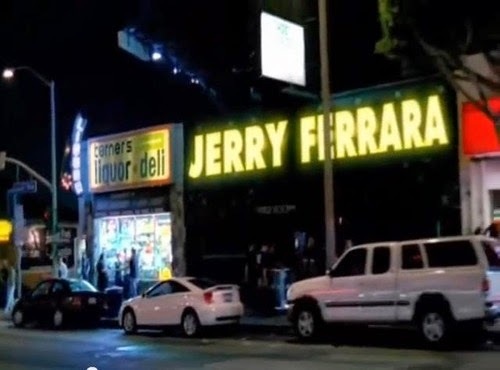 Others who were here include: Jennifer Aniston, Lisa Marie Presley, Jared Leto, Chistina Applegate, Angelina Jolie, Tobey Maguire, Leonard DiCaprio, Counting Crows Adam Duritz (who bartended here), Nicole Eggert, Mick Jagger, Uma Thurman, Courtney Love, Tom Hanks, Drew Barrymore, Rosanna Arquette, Oasis, Wallflowers, Pussycat Dolls, Gwen Stefani, Cameron Diaz, Christina Aguilera, Sean Penn, Tom Petty, Juliette Lewis, Dwight Yokum, Mick Fleetwood, Joan Osbourne, Michael Keaton, Ellen DeGeneres, Anne Heche, Rage Against the Machine, Stone Temple Pilots, Chris Rock, Go Gos, Billy Corgan (Smashing Pumpkins), John Mayer, Matchbox 20, Green Day, Billy Idol, Sheryl Crow, Everclear, and Run–D.M.C. Profile tags profile a neighborhood and its tastes. People and titles for works of art define neighborhood traits Greenwich Village had the highest density of writers, people on Time magazine covers, Nobel Prize winners and Pulitzer winners. Locative networks follow the tastes of trailblazers and where their history connects with places. They show where you cross paths with history. What gets creatively produced at places defines the dna of a locative network. It's a matter of time when locative offers along a user's dotted path will replace meaningless ads with stories and opportunities. A more human dialogue. Locative threading gives a viewer a perspective the news, social media, maps and history cannot give. The perspective offers new dimensions for understanding and a unique sensual experience. Each locative artist usually has a unique style for identifying locations and displaying locative art. Bob Egan at PopspotsNYC uses a lot of geometry, a collage of old photos, and geo-spatial patterns in architecture. That helped him find this wall at Mercantile Building (Plum and MLK Rd, Macon, GA) in an empty lot (now a parking lot) where a hotel burned down. The Allman Brothers gave a clue it was geometrically visible from Capricorn Studios (548 MLK Rd). 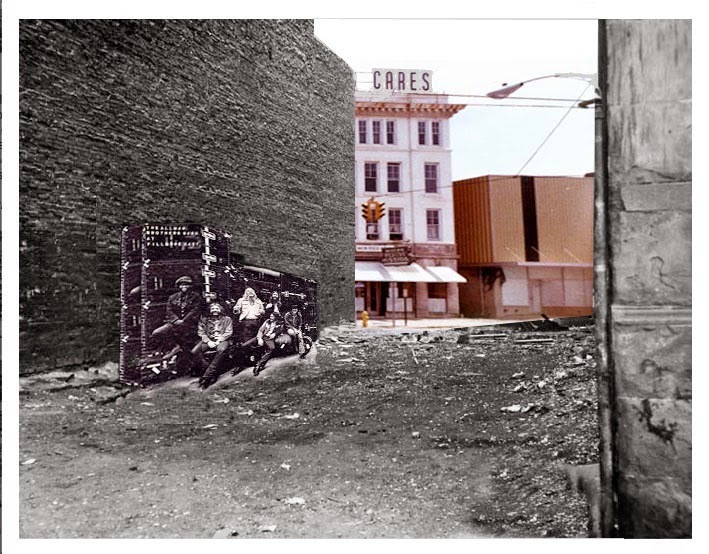 Jim Marshall re-shot the cover for Allman Brothers At Fillmore East (1971) here. 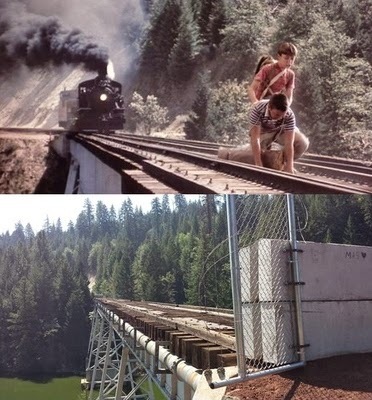 Locative Art can blend or super-impose then and now...or then and later in the past. Timelines merge in locative art. Locative media is an illustrative platform that jumps from one relevant artifact to another for exploration - indexed at a spot. Stories are searchable by address.